Collecting the works of famous artists such as Shaoguang Ding and promoting the works of Shanghai native younger artists, the gallery is committed to create a platform of painting cultural communication between China and USA. Several influential theme exhibitions were held here. With its accessible location and professional facilities ranking first in galleries of china even in Asia, it is committed to foster the creative development of contemporary Chinese artists. On behalf of “Three on Bund”, Shanghai Gallery of Are and Shanghai Art Museum co-organized 2002 Shanghai Biennale “urban creation” with great success. 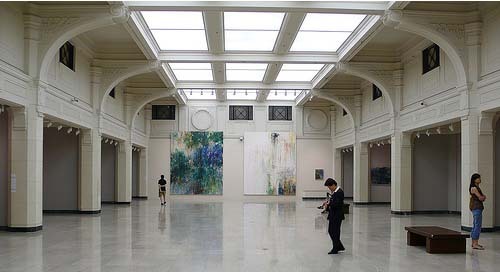 Opened in 1996, shanghai gallery, one of the earliest contemporary art galleries in shanghai, collects and deals in Chinese contemporary avant-garde art, canvas, photography pieces of art. Its mission is to promote Chinese contemporary art and support the new potential artists. The gallery was selected in Basel International Art Fair for two times consecutively. Called’ the town of modern literature’ in Chinese cultural history, it is one of the 10 tourism leisure streets in shanghai. Some Chinese literature masters lived or stayed here such as Lu Xun, Mao Dun, Guo Moruo, Ye Shengtao, and Rou Shi. The streets in 825 meters long with a history of 700 years and 225 different stores. It is along this street that Shanghai’s earliest private banks; silver jeweler’s stores and restaurants were established. Residences of traditional style are still kept on both sides of the street. Named as “small Commodities KingDom”, the street attracts more than 30 stores of traditional Chinese culture and folklore with their commodities covering 4 types—household utensils, handicrafts, wedding articles and traditional commodities. Thousands of traditional commodities converged along the old street. A famous classical garden in south China, it was once famed as the “top beauty in southeast China”. First built during the Ming Dynasty, 400 years ago, by a Sichuan minister of finance named Pan Yunduan, it has been renovated several times by the government since the Liberation. It is now one of the key relic sites of the national protection. The garden is divided into the scenic sections of “Mountains and Forests in the City¡”, “Magnificent Woods and Beautiful Valleys”, “Historical Relics of Heralding Spring”, “Water and Rockery Scenery”, “Tops in the World” and the Inner Garden.